All New Pig Pallets and Decks come with our exclusive Quality Advantage. 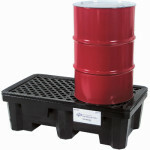 PIG Poly Spill Containment Pallets provide the ideal blend of strength and savings. 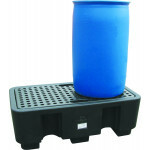 These durable pallets have anti-slip grates to secure worker's footing and drum placement to prevent slips and spills. They are easy to load with a low-profile design. Heavy-Duty Pallets are available for unsurpassed strength.